Water Bouncers with boarding platform and water slide! The Escape is an on-water getaway for family lounging and bouncing. This fully covered 12'W bouncer comes with heavy-duty, 26-gauge PVC bladders and a full nylon cover for durability. Includes a 48" wide boarding platform for easy access. 144"L x 144"W x 30"H. The Escape Bouncer Package adds the exciting Escape Slide and 110V Inflator/Deflator pump to create a complete water park for the kids. The EZ SKI 5000 Water Ski Trainer takes the fear and frustration out of teaching young water skiers. The EZ Ski 5000 is the ultimate confidence-builder, this awesome trainer teaches basic skiing fundamentals, including proper stance and handle position, improved balance, and weight transfer for turning. No more fighting with buoyant kids water skis, ski skimmers, bindings, boat wakes, or ropes! Your child boards the EZ SKI 5000 right from the swim step of your boat. The boat observer holds the handle from one end of the 40' rope and the child holds the single handle attached to the EZ SKI 5000. If the child falls, the observer simply lets go of the handle and the EZ SKI stays with the child. Inflatable seat allows the child to start from a dry out-of-the-water seated position. They are also able to sit down at any time. Built-in wood ski skimmer with bindings attached. 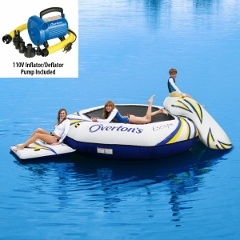 Supports water skiers up to 120 lbs.